How to Find the Best Curling Wand? Having a good hair day is vital. It gives you a confidence boost, as well as making you look exceptional for work and dates. The amount of time a woman spends in the bathroom primping ranges between 20 minutes to a couple of hours. The time depends on how long it takes her to style her hair. Once a woman steps out of the shower, she can find thousands of products that can create the look she is desiring. Mousses and gels can help add volume to the hair, while keeping the frizz to a minimum. However, if a messy look is desired, hair spray and pomades are available. In addition to the treatments that can be put in the hair, there are styling tools. Hair dryers come with different attachments that assist in holding curls or direct the hair while drying. Women can also use tools to curl their hair, such as curling irons or curling wands, or tools to straighten their hair, such as a flat iron. Finally, an appliance that helps dry the hair and curl it at the same time is a curling brush. There are multi-use appliances that have interchangeable heads. These appliances allow women to purchase one appliance to optimize their bathroom space. When it comes to deciding whether you want to purchase a certain appliance, it is best if you know what they are designed to do. In regards to selecting the best one, you will find they are more beneficial than curling irons if the hair is long and not layered. 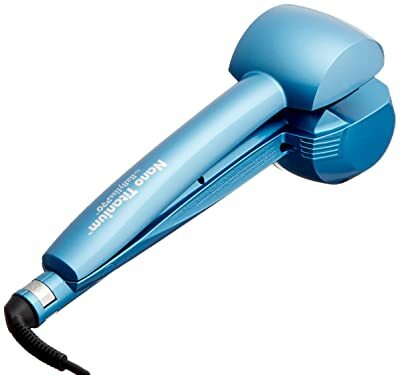 Women with naturally curly hair also find these irons beneficial because they can fix one or two of their curls without having to mess with the rest of the hair. Everyone will have their favorite brand to use, but it never changes the fact that some curling wands are better than other wands. The following are the reviews for the top five best curling wands that are currently on the market. The wands vary in price from inexpensive to pricey, and they vary in shape and use. What makes them the best is their ease of use and the versatility in the way they operate. The Remington Tstudio Pearl Ceramic curling wand is a professional styling wand that has a ceramic coating to prevent damage to the hair. The ceramic is manufactured from real crushed pearls, giving women results that mimic what they would get at a salon. 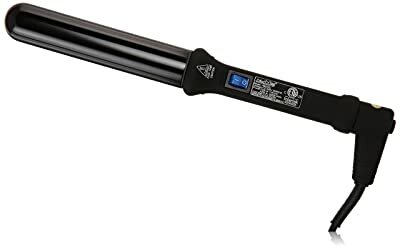 This curling wand has a large barrel, a 1.5-inch, which reaches 410-degrees Fahrenheit. This is the best curling wand when looking for high definition curls that look natural. It heats in less than 30-seconds and has an automatic shut-off feature. Ceramic coating is known for its ability to prevent snagging of the hair, but it also prolongs the life of the curling wand. When you use a curling wand, you want to use hair care products, so the coating protects the wand from the styling chemicals. This curling wand comes with a heatproof styling glove and it is cost-effective. Women love this wand because of its user-friendly features that include variable temperature setting and a lock to prevent the temperature from changing after being set. When you add that in with the ability to reach full heat in less than 30-seconds, this is the best curling iron for busy women in the morning who only have a few minutes to style and go. The BabylissPro Miracurl Nano Titanium is a unique curling wand. It is one of the best curling wands for beginners as you put the hair in and it creates the perfect curl. You control the temperature and the direction your hair goes in. Another feature that makes this curler desirable is the fact it does clamp shut so you do not have to hold your hair onto the wand. The best part of this curling wand is the fact it is an automatic curler. It comes as a kit that includes the curling wand and a shine spray. Many feel it is one of the best because it is consistent and it is effortless to use. The Miracurl heats to 450-degrees Fahrenheit instantly and cools quickly as well. The Miracurl uses a brushless motor to pull the hair in and curl it. As it is held and heated, the spray leaves a silky shine. Some of the types of curls this curling wand creates include loose waves, defined curls and natural curls. Beginners will know when to release the curl from the wand when the device signals. The three timer settings make the curling wand ideal for all types of thickness and lengths of hair. Cortex has released a 4-in-1 curling wand set before, but this is the best curling wand set from Cortex. They improved the cord by protecting it from melting, and they offer a digital display for the temperature. Cortex also simplified the process of changing the heads of the wand. 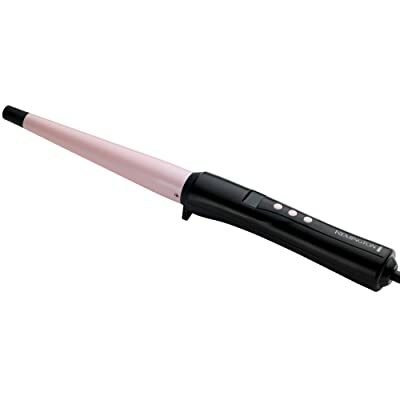 Women will enjoy this curling wand as it heats smoothly and works with all hair types. Finally, the cord has swivel technology that helps prevent it from becoming tangled while you are styling your hair. When you are done styling your hair, there is a programmable auto shut-off so you do not have to remember to turn it off if you are in a rush in the morning. 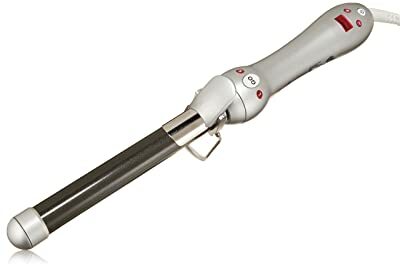 Rated as one of the best curling wands by Star Magazine, the Sarah Potempa Beachwaver Rotating Curling Iron is worth every penny. The curler rotates in both directions and was designed by Sarah Potempa, a celebrity hair stylist. It heats up to 450 degrees Fahrenheit quickly, in roughly 30 seconds. Its one-inch barrel produces loose waves that make you look like you have walked out of a salon. The barrel is protected with Tourmaline to prevent damage from hair styling products. The design of the curler includes a beveled clamp to prevent it from kinking the hair. It also automatically rotates with the press of a button and has a LED digital screen to quickly view the temperature setting. Finally, the curler comes with a cooling stand to prevent damage to the counters after use or in between curls. Women can expect a uniform heat from this curling wand due to the gold powder infusion. This is just another reason it has been rated as one of the best curling wands. The nine-foot cord is also a desirable feature, because it prevents the cord from getting in the way during the curling process. With a powerful heater that heats the barrel in less than ten seconds, the NuMe Professional Tourmaline Infused Hair Styling Wand is one of the best curling wands on the market. It is 32mm in diameter, which is roughly 1.25-inches. The thickness and straightness of this curling wand’s barrel offers women loose, naturally looking curls. This curling wand is protected with Tourmaline-infused ceramic coating, but this coating also prevents the hair from being damaged during the curling process. It also is rated as one of the best curling wands because of the negative ion technology to lower the risk of frizz. Finally, you will have hair that is more manageable and has a luscious shine that will last all day. Women will find the learning curve for this wand is minimal, and it comes with a heat resistant glove to protect your hand. It also works with all hair types and hair lengths. If you desire the bounce you see in female celebrities, then the NuMe Professional Tourmaline Infused Hair Styling Wand is one of the best products. Out of the many hair appliances, available, curling wands and curling irons are often confused. There is a difference between the two even though they have very similar names and functions. A curling wand is an appliance that has a cone shaped head where the hair can be wrapped around. However, unlike curling irons, it does not have a clamp to hold the hair onto the cone. The best curling wands are sold with a heatproof glove the woman wears on her hand to prevent burns while holding her hair onto the wand. The benefits of using a curling wand over a curling iron include the ability to have curls without the crimp line. Curling irons use a clamp that also heats up, and will occasionally leave a crease in the hair where the end is held. Another benefit is also the ability to hold the wand close to the skull and stabilize it with the other hand. This will help making curls up next the scalp easier. Before you start to curl your hair, you will need to prepare the hair first. When you have selected your wand, you want to make sure you have a good heat protectant in your hair. In addition, consider applying curl enhancer gel that will fight frizz and add volume. Finally, use various clips to section your hair. Once you finish curling your hair, it is ideal to spray a light hairspray throughout to hold the curls in place for the day. Curling wands come in a variety of shapes and sizes. They all have the same function though; they are clip less and curl the hair. To obtain the best curls with the least amount of stress, you will want to know how to find the best curling wand for your hair. As you are shopping, you want to make sure you remind yourself what type of hair you have. For example, is it short, long, naturally curly, flat, layered and so forth. It will help you get the look you are achieving while working with the hair you have. The best part of curling wands is they all offer a different look, which is why many prefer having a wand that has interchangeable heads. Regardless of which curling wand you purchase, you need to make sure you do not curl your hair while it is wet, never use chrome irons and never curl your hair without the glove. These three rules will not only keep you from being burned, but it will also prevent your hair from being damaged. When you curl wet hair, you will cause it to frizz, but it can also cause heat damage that will require special conditioning to recover from. Wands that have a very small cylinder barrel, between a half to 3/4 inch, are the best curling wands for short hair. These wands will give you a tight spiral look, similar to a perm without the chemicals. If you have short hair and want a little curl, this is the style of wand you need to purchase. However, if you have long hair or thick hair, the curling process will be time consuming. Women with longer hair, or hair with layers, will find the best curling wand is the one with the barrel an inch in diameter. These thicker barrelled wands add a very natural curl appearance, in addition to adding volume. The other thing these wands are preferred for is adding curl for an up-do look. This is the best curling wand to purchase if you only want one wand in your home and do not want the interchangeable barrels. It is very versatile and can handle a number of different hair lengths. If you are looking for loose waves, the best curling wand will be a thicker barrel. You want a wand that has over an inch in diameter so the curls are loose. You will end with natural looking waves, rather than curls at all. These wands are also great for simply adding volume to short hair. Women with bob haircuts find the thick barrels easy to curl the bob under with little work by wrapping the ends of the hair around the barrel. In addition to straight barrels, you can find curling wands that have different shapes. When you see celebrities with beach-style waves, such as Drew Barrymore, they often have had their hair styled with a reverse curling iron. While this style of wand is not ideal for short hair, it may be the best curling wand for long or thick hair. It is forgiving, and comes in two different shapes. You can find the reverse curling wand with an ascending barrel (where it gets bigger at the top) or descending barrel (where it is bigger next to the handle). While it may be more complicated to use, and the shape looks intimidating, the pearl curling wand is the best curling wand to create a natural curl. It also works with everything from short layered cuts to long full hair. When the hair is wrapped around the balls, or pearls, on this wand, it will give you the look that can fool people into thinking you were born with curly hair that always obeys. You can create curls that are wild, while still controlling what direction they lay. Not all curling wands are built the same, and some brands have mastered the art of producing the best curling wands. When you are looking for the best brands, you want to look for the ones that benefit the beginners. Women often want the same look as a celebrity, but do not have the expertise of a hair stylist. Therefore, the best curling wands are user friendly. Remington and Conair are two brands that are well known for their hair styling products. They also do not disappoint with their curling wands. They are two of the best brands, with Remington producing one of the best curling wands on the market. They take into account that everyone has to start somewhere when it comes to learning to style their hair, but they also make products that are lightweight and produce natural results. Two other brands that are commonly associated with hair care, that also produce excellent curling wands, include Bed Head and Infiniti. Bed Head is still fairly new, especially in the United States. The company is based in the United Kingdom and their products were originally only distributed to salons. Finally, some other brands that produce some of the best curling wands include Cortex, Sarah Potempa, Hot Tools, NuMe, HIS Professional and Fahrenheit. One brand that has been dabbling in extending their hair styling products is Goody. They have produced a curling wand, as well as flexible curling rods. Goody strives to make hair styling simple for everyone, despite the experience level. When it comes to styling your hair, you want products that are user-friendly and safe. It is not realistic to visit the salon every morning to have hair that looks like celebrities right off the red carpet. However, with the purchase of a few products sold in stores, you can achieve the same looks at home. The best curling wands are ones that offer versatility, protection from heat, but also the ability for all experience levels to master the look. The top five curling wands listed are only the tip of the iceberg of the devices and tools that are available to make your hair work the way you want. When looking for a curled hair look, you will need styling products that work with the curling wands. After preparing your hair, look for the curling wand that has the barrel head that will create the desired curl. Depending on the amount of time you have to curl your hair, you will want a wand that heats and cools quickly, but you will also want to look at automatic rollers to speed the process up. Curling wands give women the ability to style their hair by themselves, regardless of the type, thickness or length of hair they have. Curls can be as tight as a perm or simple loose waves. If you are fickle and want the versatility to change your hairstyle from day to day, the best curling wands will be the ones with interchangeable barrel heads. Finally, look for curling wands that include a styling glove or you will need to make sure you purchase the glove separately.